Exactly what is a CSA? How does it work? Community Supported Agriculture (also known as Community Sustained or Shared Agriculture). It is a membership based system where the member signs up and pays for an entire season’s worth of vegetables upfront. The member then has access to fresh vegetables weekly throughout the season. CSAs are designed to connect the community with their local farms and farmers, giving them access to fresh food for their family. With Juniper Hill Farm, a CSA Share is a weekly bounty of our harvest adequate to feed 2-3 people. In the early spring, a basket may contain spinach, lettuce, sugar snap peas, scallions, and stored carrots, beets and parsnips. In the late fall, a share will have plenty of winter squash, brussels sprouts, turnips, cabbage, onions, garlic, and a variety of potatoes. Shares in the summer cover just about everything between, all for an affordable early investment in our business. How is supporting local agriculture beneficial? There are many socioeconomic benefits to being a part of a CSA and shopping at farmer’s markets. Supporting local agriculture by buying from a local farmer, who shares your views on providing families with wholesome and healthy goods, helps support your community’s economy. Investing in a farm with the CSA model allows a farmer to more easily grow his or her business, and stay connected with the people who need their produce most. Frequenting farmer’s markets, getting to know the vendors and their stories, will give everyone new insights to how food is grown, harvested, and enjoyed. Opting to buy at a particular farmer’s market will strengthen that market, expand that market, and hopefully lead to bringing markets closer to your home. Helping establish new, or fostering struggling farms encourages competition and increases the quality and affordability of all products for everyone to share at these markets. It’s a cycle, a new take on an old way of life, that we’re happy to see become more and more prominent across the North Country. What is NOFA NY and what does it mean to be Certified Organic? NOFA NY stands for the Northeast Organic Farming Association of New York. NOFA NY is a non-profit organization that works to provide the community with programs and services that support sustainable, local organic food and farming. NOFA NY members work together to create a food system that is ecologically sound and economically viable. Through education, certification and advocacy, NOFA NY promotes organic food production, local marketing and land stewardship. For more information or to get involved with NOFA NY, please visit their website. Becoming certified organic is a process that allows for food and other agricultural products, such as produce and seeds to be represented as organic. Any business involved in the production of food can be certified, from farmers to food processors to restaurants. In 2002, the USDA National Organic Program (NOP) implemented federal standards for organic products. Organic standards address such factors as soil quality, pest and weed control, use of input materials, and humane treatment of livestock. Meeting these NOP standards is the core of the organic certification process and is required for a producer to use the word “organic” or the USDA Organic seal on food, feed, or fiber products. Where can I find a CSA or Farmers Market? Our where to find us page has details about which farmers markets around the Adirondacks we’re a part of, and which local restaurants we sell to. Feel welcome to contact us if you’d like to visit our farm in Wadhams! We encourage yo to check out www.adirondackharvest.com for all kinds of information about the best of Upstate, New York’s finest fresh produce. They have up-to-date lists of Farmers Markets and CSAs throughout the North Country, and many reasons why you should consider supporting farmers and staying local. If there are any specific products you’re looking for, try Pride of New York’s brief search form. Chances are, there’s a farm stand or market close to home, and happy to have you as a customer. If our payment options don’t work for you, please give us a call or send us an e-mail to discuss unique arrangements. We need as much funding as possible in the beginning of each CSA season, but we also believe healthy, sustainable living should be accessible to everyone. Of course! If you’re not yet convinced to immerse yourself in the CSA lifestyle, stop by our stand at any farmers market, or come by the farm on our pick-up days. Though some limited items might be reserved for members on particular weeks, and the prices for our products will be a little higher, we always welcome and try to accommodate new faces as we would our biggest supporters. Click here to find out where to find our market stands this season! 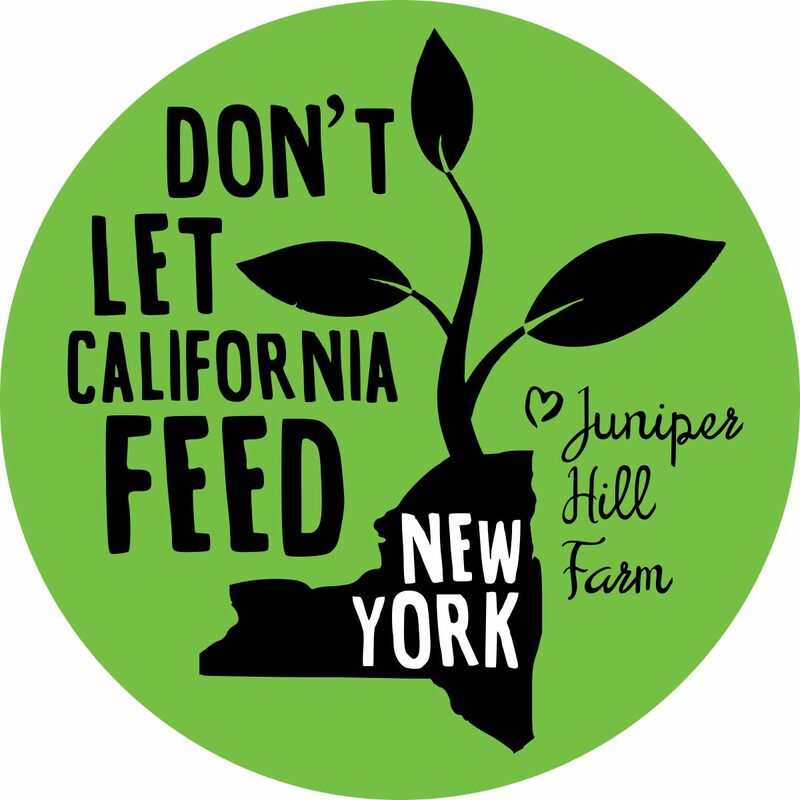 Since 2008, Juniper Hill Farm has relied on the CSA model. This is an incredible model that allows us to connect directly with consumers allowing them to buy local, seasonal food directly. In the CSA model we ask for some money up front to get going as all of our expenses occur months before we can deliver your first basket. The potting soil, greenhouse heat, seeds, labor, and tools to make the season a success need to be purchased in December and January. I like to compare it to the interest in your bank account. You have given us a loan and in return your interest rate is farm fresh vegetables that are delivered often at a better price than you can find elsewhere. CSA members join with their farmer in both the risks of farming (crop failure, poor weather, bad traffic) and its benefits (a bountiful harvest season, cooking recommendations, direct relationship with the farmer, and the ability to come visit the farm). I understand that my share will vary from week to week, in both quantity and variety. We do our best to know what is in the field and get it to your plate. Throughout the past years we have had our fair share of disasters, from tomato blight to hurricane Irene. These were challenging situations for us as farmers and for our membership. We do everything we can to put food on your table and hope to be in your household for years to come, but as Irene showed us we can’t plan for all of it. With that said this will be the best growing season yet, and we look forward to seeing you there! Your commitment is a purchase agreement and is non-refundable. We have used these funds to grow the food that is in your share. All sales final.